It is important that the following accreditation information of Chesapeake Bible College & Seminary be understood by all considering becoming a student of Chesapeake Bible College & Seminary, prior to their admission, into our School. On September 1, 2008, Chesapeake Bible College & Seminary became a fully accredited and affiliated university of the Oxford Educational Network, through Wolsey Hall, which is not affiliated with Oxford University in Oxford, England. Chesapeake Bible College & Seminary has held accreditation with the Accrediting Commission International (A.C.I. ), which has a membership of over 320 schools, colleges, universities, and theological seminaries in thirty-nine of the United States and in eight countries around the world. It is the world’s largest non-governmental accrediting body. Chesapeake Bible College & Seminary is not a “Title IV” school, nor does it hold a “Regional Accreditation,” such as the Middle States Association of Colleges and Schools (M.S.A.C.S.) or the Transnational Association of Colleges and Schools (T.R.A.C.S.). Because Chesapeake Bible College & Seminary is not a “Title IV” school, it does not receive any State or Federal funds in the form of grants, loans, etc., nor is it eligible to accept scholarship funds through programs such as the G.I. Bill. 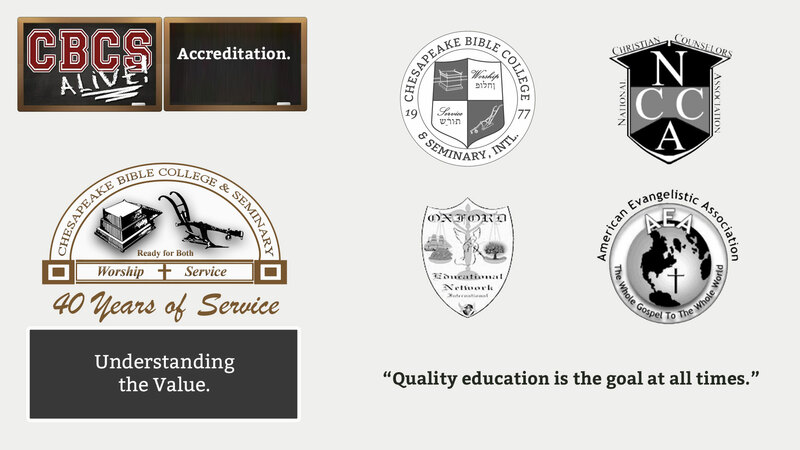 Chesapeake Bible College & Seminary does not guarantee the transfer of course credits or degrees to other institutions or organizations, since our accreditation may not be viewed as being on the same level as theirs. Since many denominational religious organizations do not accept course credits or degrees from outside their particular systems, graduates from Chesapeake Bible College & Seminary may be required to repeat courses already taken. Chesapeake Bible College & Seminary (by law) can only grant religious degrees. These degrees are for the purpose of personal growth and advancement in Christian Ministry and not for advancement in secular employment or education. Thank you for reviewing this information.If you should have any further questions, please feel free to Contact Us.